Jason Wu weds long term boyfriend in glamorous Mexican fiesta | HELLO! April 09, 2016 - 14:34 BST hellomagazine.com Jason Wu has wed his long term boyfriend, Gustavo Rangel. The pair tied the knot in an incredible Mexican fiesta filled with famous guests. 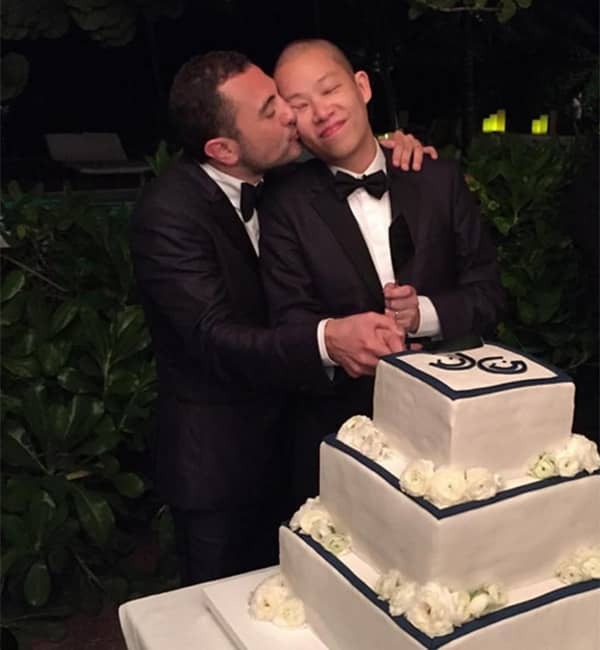 Jason Wu has wed his long term boyfriend, Gustavo Rangel. The pair tied the knot in an incredible Mexican fiesta filled with famous guests. The celebrity favourite fashion designer and his fiancé looked stylish in matching tuxedos as they exchanged their vows. Jason married his partner, who is also his business partner, in a lavish ceremony in Tulum, Mexico. The party, which took place on the beachside, was full of Mexican traditions including pinatas and tequila. The guests enjoyed a beautiful outdoor reception complete with a white and navy wedding cake, and took to social media to share snaps of the amazing wedding. With trendy guests including Diane Krugar and blogger Bryanboy, both the grooms and their guests looked fantastic as they celebrated. Jewellery designer Jennifer Fisher created custom rings for the special day, and the groomsman wore matching Stubbs and Wootton shoes with "The End" embroidered on them in script. The guests even jumped into the pool at the end of the evening, with one guest posting a photo with the caption: "black tie pool party." Although she didn't attend the wedding, Jason's designs are a particular favourite of Michelle Obama's. At Barack Obama's last Inauguration, Michelle revealed her gown, designed by Jason. In response, he tweeted: "#inshock!!! Mrs Obama likes to keep her secrets. She fooled me again!" According to an interview in Out magazine, Jason met Gustavo originally met through a friend on New Years Eve, and eventually became a couple six months later. He said: "It's good to have someone that is real and honest." "Sometimes you don’t see who you are after a long time, especially if you’re busy and working toward something. It’s nice to have someone who’s a mirror. You may not always like what you see, but it’s true."